Robert Clark is a Senior Fisheries Officer and Deputy Clerk. His is a job that provides a variety of challenges every day.The Sea Fisheries Committee regulates, manages and protects inshore fisheries around England and Wales. Robert’s job entails hours of patrolling, at sea, to perform inspections-and monitor the positions- of fishing vessels. These details are kept in various data bases. All the fishing gear and catches of these vessels are checked to make sure that Bye-Laws and European Regulations are being adhered to. In order to carry out his duties, Robert has to maintain a good level of seamanship. He must also hold current certificates relevant for work on a boat, including those in navigation, helming and manning the radar; all such professional necessities are underpinned with additional qualifications. Skills in how to secure the boat with ropes and buoys are also essential. Fishing Officers need to maintain a high level of personal physical fitness; especially when they board fishing vessels from the Rigid Inflatable Boat (RIB) in one leap! They must have confidence in their ability to jump from the RIB to a fishing vessel in, what are often, very challenging conditions. Personal safety may depend on their judgement of what is safe and practical.A good understanding of fishing technology and the ability to identify a range of fish species is of course, a must! 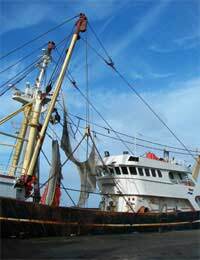 Finfish that have been caught, such as cod, whiting, mackerel and plaice must measure a specific length. The length of carapace in crustacae like lobster, and the width of crab are measured. Molluscs-clams and whelks must have a specific length of shell and king and queen scallops a certain width of shell. Anything smaller must be returned to the sea. Being a Fisheries Officer is as much about protecting and developing the marine environment as anything else. Robert particularly enjoys working with scientists and fishermen to gather data on the marine environment and fish stocks, in the process of informing and generating dialogue on how best to manage the fisheries resources. Trialling techniques are used, for example, to investigate the improvement of cuttlefish egg survival and create seabed maps.Around this island there are Conservation Areas and European Marine Sites, designated for their international importance to sea life. Each individual who works in the fishing industry is an important link in the chain of responsibility to maintain and balance the future of our marine environment.It’s all about teamwork.